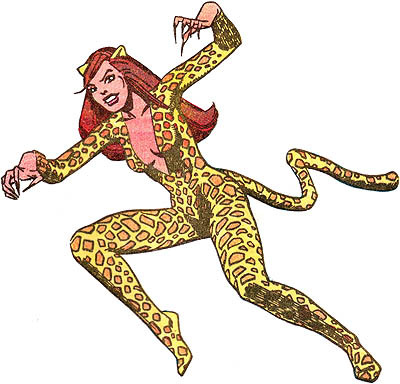 Cheetah has no super human powers, however she is a superb athlete, acrobat and a cunning strategist. The niece of Priscilla Rich, Debbi Domaine had feelings of guilt about her wealth and privilege which lead her to join extreme ecological groups. Summoned to her aunt's deathbed Rich died before she could reveal her criminal secret to her niece. Recoiled by the sight of her dead aunt Domaine staggered and was knocked unconscious. Domaine awoke to find herself in the hidden headquarters of the cult leader Kobra. He explained his intent to recruit the Cheetah, but now that she was dead he would have to make a re-creation. Exposing Domaine to mental conditioning and shock therapy Kobra created the hopelessly insane Cheetah.